The first two weeks of the 2016 legislative session have been very busy here in Olympia. The energy level is incredible and the pace is stunning. My time has been filled with committee meetings, visiting with constituents, and finalizing details of my 2016 legislation. I am still hopeful that the legislature will adjourn on time and that we will be true to our task, recognizing that this is a supplemental budget year and make only minimal, necessary adjustments to our budgets. You may have read recently about the erroneous early release of 3,200 inmates by the Department of Corrections (DOC), which resulted in the deaths of two people and a number of other crimes. This is egregious, unbelievable, and a major betrayal of public trust by a state agency. It is important for the Legislature to play a role in finding answers about what went wrong and how this will be corrected. 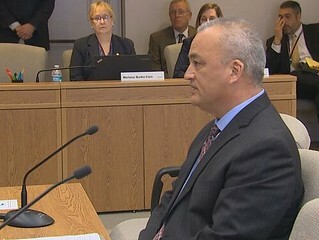 The Senate Law and Justice Committee has sought subpoenas for records from the governor’s office and the DOC after DOC Secretary Dan Pacholke (pictured left) failed to provide answers before the committee last week. I am pleased to see the Senate push forward with this process and work to guarantee a truly independent investigation into this matter. I am disappointed that even now, after more than 30 days, DOC has obstructed a clear path to much needed answers. As a member of the Public Safety Committee, I am committed to working with my fellow lawmakers to restore public trust and ensure this never happens again. Rulemaking activities by state agencies affect your life in ways you may not even realize. Aside from the high cost to taxpayers for agencies to promulgate these rules, they create uncertainty and unpredictability for business – and ultimately to you – when agencies make rules that don’t comply with legislative intent. I have introduced HB 2554, which requires the Joint Administrative Rules Review Committee, on which I serve, to review rules imposed by state agencies under certain circumstances. This is important legislation to provide oversight and accountability, and prevent agency overreach to make sure the rules comply with legislative intent. The current process is very weak and subjective. My bill strengthens the process and ensures that more of these rules go through the review process when a petition for review is filed. My bill has been scheduled for a public hearing in the State Government Committee on January 28 at 1:30. You can watch the hearing live on TVW. Here are the other bills I have introduced this session. I will discuss these in greater detail and update you on their progress in a future update. HB 2713 – The Women Helping Women Act. This bill dedicates all revenue collected from the sales tax on feminine hygiene products to support domestic violence victims’ services and resources. Read my recent press release here. HB 2712 – Addressing the use of force in self-defense. HB 2553 – Protecting the constitutionally guaranteed right to the lawful possession of firearms during a declared state of emergency. HB 2555 – Authorizes the installation of directional signs for auto malls on state highways. I was visited this week by the outstanding 2016 class of Leadership Clark County, a civic leadership development program in Southwest Washington. Each year they travel to Olympia to engage with lawmakers and get a first-hand look at what goes on at the State Capitol.